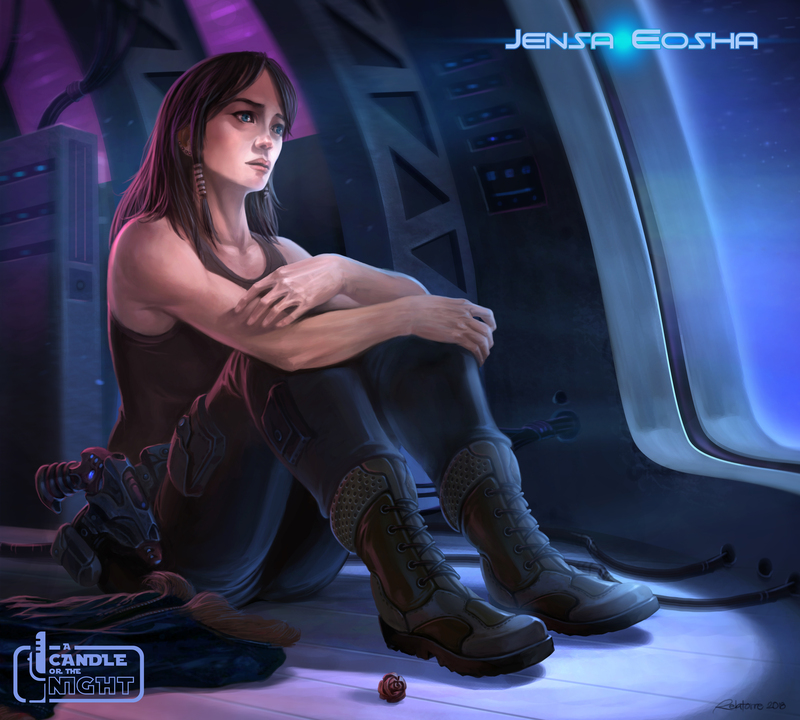 Jensa was born on a planet in the Outer Rim, though she left at too young an age to remember which now. She was identified at age 2 by the Jedi Order as being Force Sensitive and was taken to a small Jedi Temple in the Mid-Rim. Though initially she was only to be there a short time until transfer to the Jedi Temple on Coruscant, the Clone Wars were just breaking out. Intense conflict between the Republic and the Separatists resulted in the Order deciding not to relocate padawans back to Coruscant space. Just as she was becoming of age to begin her Padawan training, Order 66 happened. The Empire eventually found their way to her remote Mid-Rim Temple. She was evacuated by the loving sacrifice of a Temple Groundskeeper and unfortunately witnessed the brutal murder of everyone she knew and loved at a tender young age. This trauma scarred her deeply and bred in her a deep self-reliance and survival instinct. In her adolescence, she picked up piloting skills while serving as a copilot for a prominent smuggler. This began her eventual career as a pilot-for-hire and smuggler. She spent all her life learning how to evade Imperial Authority and scrape out a life on the edges of the Galaxy. Her gift in the Force is foresight. She initially did not understand it as such, but rather concluded that she had a very well developed ‘gut instinct.’ For years this gift only served to show her disorganized images of the violence and pain that was spreading across the Galaxy under Imperial Rule. However, once she learned to understand and embrace this gift, in no small part to the tutelage of Jedi Knight Alda and Jedi Master Grayden Nouen, she began to realize what a powerful asset this skill could be. Jensa is a survivor at heart and is slow to trust. She often would rather shoot first and ask questions later. However, she is also fiercely loyal to those she has bonds with. She also tends to sympathize with the underdogs in the Galaxy. One thing is for sure, there are few pilots with the innate talent she has, due in no small part to her effortless weaving of pre-cognitive visions from the Force and lightning fast reflexes.